Jennifer is adding this class to the end of her around the Garden Show mystery Block Of the Month end of the year party! 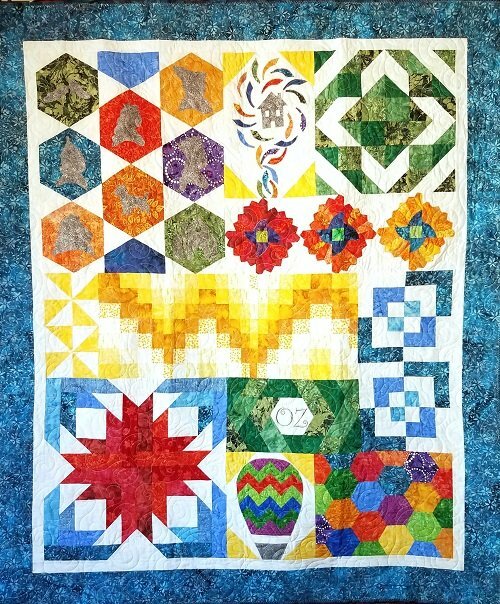 Over The Rainbow is Jennifer's next delightful and original Block Of the Month quilt. In this class, students will get to see the completed quilt and receive all of the instructions. This class is demonstration and instruction only. Do not bring your machine as we will not be sewing in class. Like any good party there will be GAMES & PRIZES! We'll also have Treats & Snacks but please BYOB (Bring Your Own Beverage) of choice and bring a finger-food treat to share if you'd like (plates & napkins will be provided). Please also bring your Show & Tell of projects you've made in Jennifer's classes. Gardeners, please bring your "Around the Garden" project in any state of completion. Chairs are a bit limited and we will have about 30 attendees so please bring a folding chair if you have one. This final day of in-store shopping and the Party are reserved for Around the Garden participants and students who have signed up for Over the Rainbow. Please sign up online, call Tops and Bobbins at (760) 881-4025, or stop in the Shoppe to confirm that you would like to purchase the Over the Rainbow pattern so Jennifer knows how many patterns to bring to class. Thank you! No refunds unless cancellation is made 7 days prior to class or class is cancelled by instructor.